Goodness gracious me and bless my biscuits, these months are dropping over like outhouses on Halloween, 1-2-3-4-5-6- and half the eighteenth year of the first century of the third millennium is done, put to bed, lights out. The palm tree stamp I used for both cards is from my NBUS "Totally Trees" set by Stampin' Up. For my Thinking of You card, I embossed the three colors of paper with a waves die and then pieced them together to make them look like sand, sea, and sky. The sun is from Lil Inkers, the glossified Adirondike chair and sediment are from Technique Tuesday. The beach ball is a sticker. 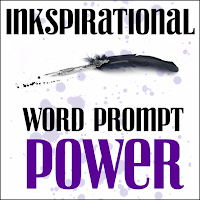 Inkspirational: Power. I believe there is power in the sunshine and the seaside to relax and restore the body and mind. And to give you a sunburn, so be careful out there. SSS Work It Wednesday: Summer. 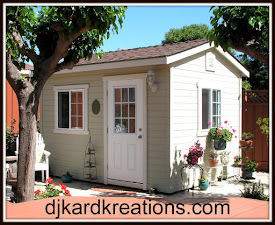 The House That Stamps Built: Repeat Impressions DCC66: Summer vacation. Putting on his surgeon's mask, Hammy operated on the palm tree after noticing that the fronds would make a very dandy evergreen Christmas wreath! Right?! It was a fun and QACAS way to stretch the stamp, which is still useble as a palm tree. 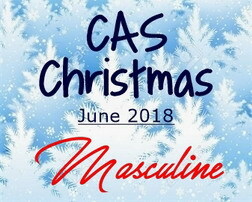 CAS Christmas Card Challenge: Masculine. Stamping Sensations: June = anything goes. TIME OUT: Holidays (twist: one layer). 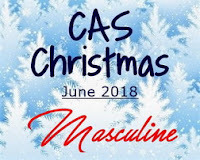 I hope you'll get the opportunity to play along this month! The challenge is open until the end of day on June 24th. Remember you can simply use the same tree as a conventional tree on both your cards and just change up your design! You don't have to get all jiggy with it! Please click over to the Twofer Card Challenge to see the amazing Twofer cards our talented Guest Designer Maria Rodriguez and the sensational ladies of the Design Team have made to inspire you!! Thank you for your continued enthusiasm and support! Mwah! What a fabulous twofer Darnell - love your big wave, and who said cards have to be realistic?? Hammy is very skilled as a surgeon I must say, and your wreath is phabulous! You're right it is amazing how quick the year is sliding by .... and for me getting ominously close to a momentous birthday ... no point in worrying too much as time is out of our control ... we just need to get on and make the most of it! I get you ... Time is passing awfully quick! Superb cards Darnell and so totally different. I could do with sitting in that chair and having the wave wash over me ... It's rather hot! Hope all is well in your world... Sending hugs! Oh my dear Darnell, you are correct, time just rushing by like the wind and we must take a slower pace to enjoy all the beauty around us, no matter what Season of the Year. One of the best things to do is to CREATE so here we are sharing what we love with everyone. I love your Twofer cards, what a fabulous and beautiful way to create a Christmas Wreath and a sunny and warm beach scene, which I wouldn't mind being in right now, tell Hammy he is a brilliant surgeon, LOL!! Love the sentiment on your Christmas card and the bright enamel dots complete the card beautifully. 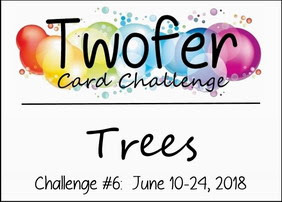 Thank you and the awesome Twofer Challenge DT for inviting me to join you guys on this challenge as your Guest Designer, it's an honor and a joy. Two fantastic cards! Love the second one, I would never have thought to do it! Two great cards!! Love the first card with the different layered background! Two great cards, here, Darnell. As for the ominous ocean, if you look at it again...the darker blue is the ocean and the lighter blue is the sky. That's how I'm choosing to look at it so the poor soul doesn't get washed away. :) And your wreath card is so clever. Excellent job on both! Enjoy every single moment! Hugs! The summer card looks simply amazing, love it so much!! Such great dimensions you given with the waves die!! Thanks for your stunning inspirations! Looks like the sunbather has deserted the chair and run for cover. She saw the wave and decided it was time for a break! 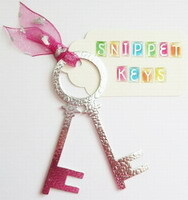 Love how you've embossed the different colors! Your wreath is amazing! I see that palm trees make lovely Christmas wreaths! I am really stunned at how much your palm tree looks like a pine tree! WOW! Both cards are truly wonderful. Oops, forgot to check the box! Such a clever way of repurposing your stamps to create both a summertime and a holiday card! Both are great and I'm totally in love with the beach scene. Wish I was there right this instant!!!! Wow Darnell! I love how you use the palm tree to make a wreath!! Genious! You made me laugh talking about your ominous wave! LOL! I didn’t see it that way till you said that! Beautiful cards, both of them! Oh my gosh! I would never in a million years think to use a palm tree as a wreath. Amazing! And I think your wave is just right, but the sentiment needs to be altered to somehow fit the word soaked. :) Have a wonderful day! If I had been the one sitting in that chair under that hot sun, I would welcome that huge wave cooling me off. What a great scene and I wish I was there. The wreath is just beautiful and I would never have thought to use the palm tree. Of course, that's why you make those big bucks. Can't wait to play. When you put the timeline like that I feel decrepit. It's a small wonder I am still able to make a card. Super awesome card designs. The palm tree looks like pine needles for sure on your pretty holiday wreath. I am so amazed. You have set the bar high for us to come up with a great way of using trees. Hopefully, I can think of something myself so I can enter. You learn something new everyday, i.e., exactly where you are within the third millenium and that palm fronds look like pine boughs. What a terrific take on this Twofer. Love both the cards. That beach scene is awesome with the paper piecing and the wreath really is beautiful. Now, I'll have to think something up...hmmmm! Great use of the tree stamp. I'm not good at seeing alternates in my stamps. Love the waves on the beach card. So, it's pretty hot out there, a splash from a wave would be a great cool down. Love them both. Fantastic and fun cards Darnell! Clever change-up of the palm fonds - love it! Hi Darnell, Both cards are lovely. Another awesome Twofer Challenge, Dolly. Loved both your very creative use of your palm tree fronds. Your die cut pieced together sand, waves and sky background for your 1st card was so cool. Yep, that wave is getting mighty close..lol! Loved how you used your fronds (with hammy's help) for your pretty holiday wreath. So clever of you both. TFS and Congratulations on your 6 months of Twofers:-) Time does fly by...Hugs. To use the palm fronds for a winter wreath is genius! And it looks fabulous! Very clever use of the palm tree fronds to make a Christmas wreath (I'm sure Hammy's tiny paws were perfect to do the surgery on the stamp!). I really like that Christmas sentiment - I must look for that. And I was thinking "what a lovely beach scene, I'd like to be there" until I read your comment about the ominous size of the wave and I started thinking about tsunamis and decided I'd rather sit in my backyard! Two brilliant cards Darnell and two super ways to use the image. Great sentiment on the lovely wreath and it is certainly lucky that no-one is sat on that chair, great touch with the beach ball. You are very clever. Who would have thought to use a palm tree to make a wreath? Fabulous. You are just SO clever, Darnell!! Love them both. Holy smokes Darnell, I would never have guessed your pine wreath was made with the palm tree! You are one clever lady. These are both amazing! True story: my SIL and I were floating on rafts in the Gulf of Mexico on very calm smooth water. Out of know where a huge wave came and sent us both tumbling head of heals to the bottom. We came up coughing and confused with not another wave to be found!! Your sand/sea/sky background looks amazing! So clever of you to piece it together like that. And I love the palm branch wreath--it definitely looks like pine branches. Another great idea. I'm going to have to think about this "tree" thing, and see if I can come up with any ideas. 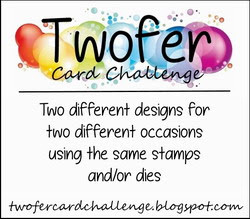 Love entering the Twofer Challenge. 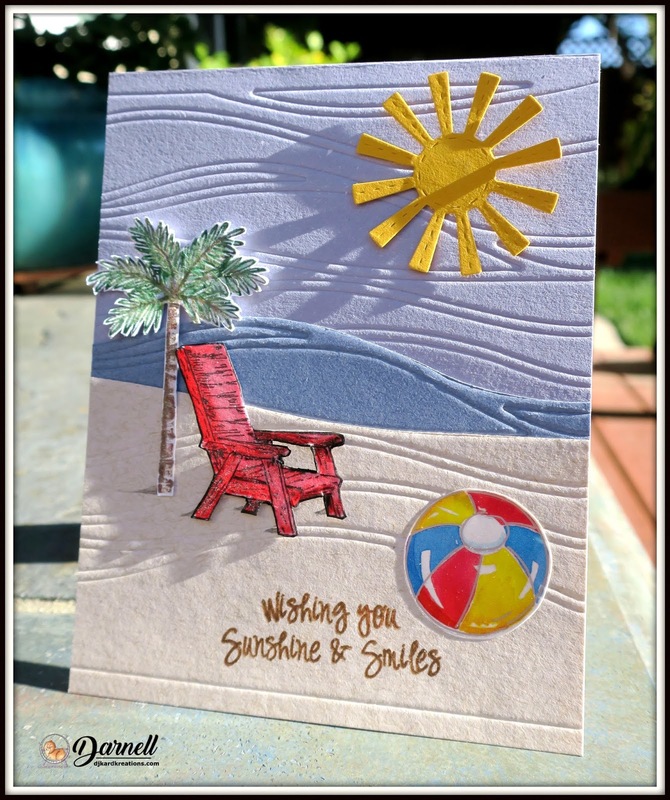 LOVE the way you've used the wave die to create your sand, sea and sky, Dolly! Great piecing together and the texture from the dry embossing is delicious! The perfect way to enjoy that sweet spot is with a comfy adirondack chair and shaded by a lovely palm. What a wonderful place to vacation! 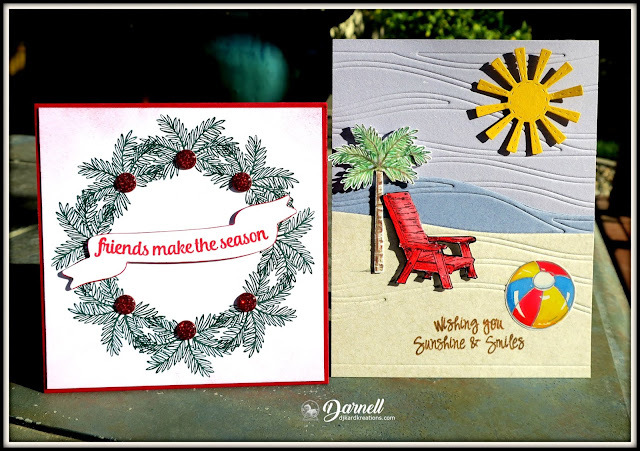 Two beautiful cards Darnell, I'm off now to have a rummage through my stamps with trees on. Both such fabulous cards but just coming off of winter I have to say that I am preferring the beach card with the palm tree--lol! Very clever use of the tree stamp on the wreath card. Love, love, love the beach scene you created - I can almost feel the sand between my toes! So happy you played along with the Summer Vacation theme over at The House That Stamps Built! These two cards couldn't be more different and I'd never guess your evergreen wreath was made from palm fronds! Gosh, you've sure got the sunshine to go along with your beach scene. Love how the embossing works for sand, sea, and sky. I've got my twofer stamped and ready to color this time. Hugs! Two fabulous cards!! The summer card does look so very inviting (minus that 'omminous' wave of course!) 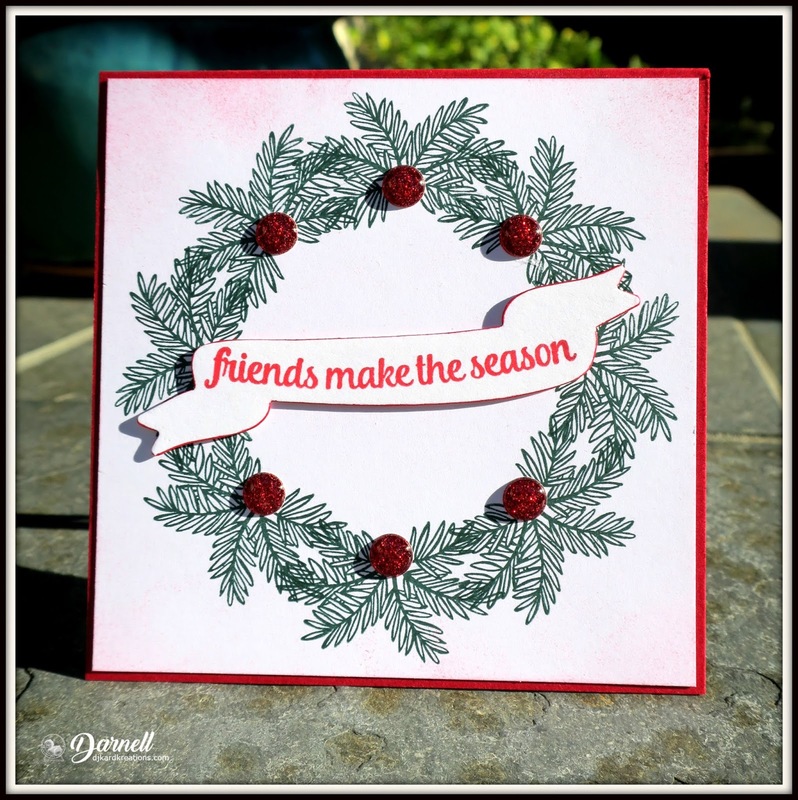 and such a genius idea to use the fronds for a Christmas card; it works perfectly! Thanks for playing with the House That Stamps Built. Going from a hot summer's day all the way to Christmas - now that's stretching your stamp! It's no stretch to visualize it though, it truly does look like pine needles! I love waves die used for all three parts of your background, it reminds me of warm summer breezes. Your wreath is so perfectly stamped, and those sparkly red berries are so bold and brilliant. A wonderful Twofer, Darnell! Love your amazing wave background! And what a brilliant way to use that palm tree! Your summer scene is wonderful and I love your wreath, so fluffy and full with the perfect red berries. A palm tree in the beach scene tuned into an evergreen Christmas wreath!? How creative you are, Darnell! Two lovely cards! I love the way you layered that waves embossing. Your beach scene is so lovely and inviting and your bold wreath is great! Thanks for sharing with us at Inkspirational! Fab ulous cards Darnell. I love that you saw the palm fronds as holiday greenery - brilliant! I hope to play along this time - missed the last two - time mojo both beyond my control. I love the colors of your sand, sea and sky, Darnell, and no worries about the wave. It's too far out to sea. Kudos to Hammy for seeing a Christmas wreath in the palm fronds. It looks terrific. No way. Saw the beachy scene in the SSS gallery and came by to say I wanna go there!!!! Had no idea this was going to be a onefer, of your twofers! Wow on that wreath. Bet that was kinda tricky to make, but looks great. What a twofer! You all knocked it out of the park with this tree challenge. Fabulous wreath with the palm fronds, Darnell! Just love your serene beach scene too!! Two beautiful creations! I'd love to be sitting in that deckchair right now! 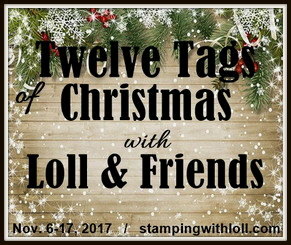 Thanks for sharing with us at Stamping Sensations this month and Good Luck!